Here's a peak (and working prototype) of what I'm working on. Click to give focus, then use arrow keys to move. It's a rogue-like, but will utilize the Talesworth Arena combat system to some extent. Performance is the next thing to tackle, I really need optimize this code. I've seen the suggestion a few times in the Kongregate comments to change the scoring to be based on "total tools used", rather than requiring specific tools to be used. I wanted to share my thought process on that to shed some light on why I ultimately went the way I did. This was absolutely a design consideration when making Episode 2, and a good one at that, but ultimately, not the best approach in my opinion. In its original form, Episode 2 worked similar to Episode 1. The player was only given enough tools to complete each room. I wanted to make the game more accessible to players of all skill and dedication levels, so I needed a technique to make it possible to complete rooms at an easier level. Adding in extra tools was done to create many more possible solutions. The key point here is that adding more tools makes the room easier to solve. A gold star is more challenging because there is only 1 solution, maybe 2 if you discover a platinum solution, because you are given very specific tools to use. The suggestion to be able to use any breakdown of tools would make it much easier to achieve Gold. There were many instances when crafting rooms that I knew that having just one more loot bag would make a room's solution infinitely easier. Again, in its original form, you wouldn't even have those extra tools, so if you play the game with this mindset, you won't even consider going beyond the Gold level's tool placement restrictions. I hope this helps understand my logic. So far, so good. I think the difficulty is in a good place for Gold stars, and I've seen solutions posted for at least 12 or 13 Platinums so far! Great work everyone, truly impressive. 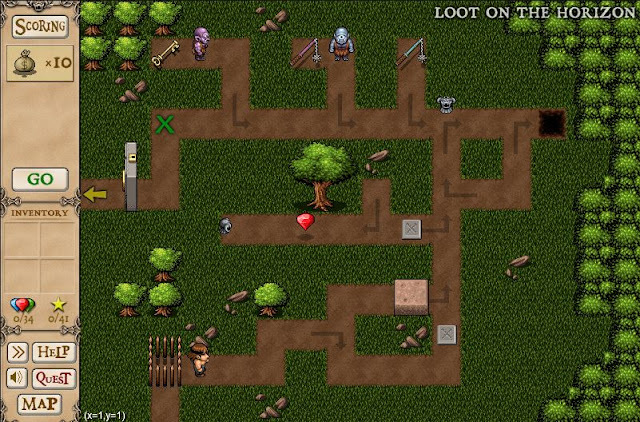 I just pushed an update, v1.1.2, that removes a loot bag from both Deadly Loot and Last Line of Defense. This probably breaks a couple of those Platinum solutions, but I think it needed to be done. Deadly Loot - Somewhere along the line, I added an extra gold bag in there. Not sure when it happened, but I can't even solve it worse than Platinum right now. Consequently, I removed the bag. Platinums should be very difficult and hard to find, and this felt too easy. Last Line of Defense - A couple people pointed out that it was inconsistent that Questy could score a Platinum on a level by saving a loot bag and not even leading him out of the room. I added a path that allows him to exit through the south exit without a loot bag, and removed a loot bag from the bags available. On the flip side, it's technically not possible to get Gold if you somehow figured out a way into the North exit, but I think this setup makes more sense than the way it was previous. App Store status update, we are in review! That's a good sign. One lucky Apple employee is, at this moment, guiding Questy through the dangerous Kingdom of Talesworth. We are hoping for approval to go live in a couple hours, then I think it is a small delay of another couple hours from when we hit Publish until it shows up. Fingers crossed. 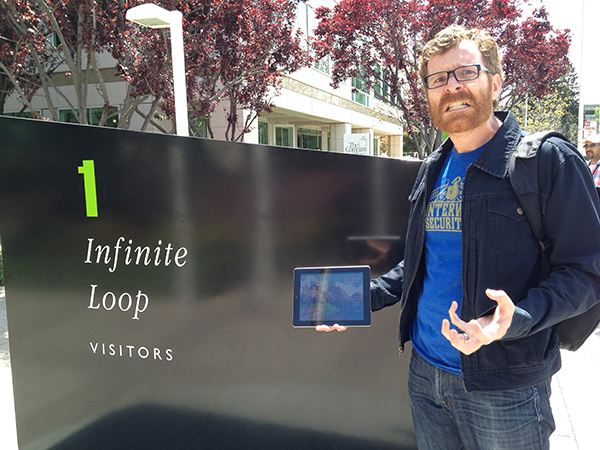 Here's a picture of Dave (good friend, Talesworth iOS coder, level 9 barbarian) literally at Apple today. Favors were asked. We're hoping for approval by Friday at the latest. Ugh. We're waiting on the App Store to approve our current version, but I'm guessing it won't be Monday. We shall see! As soon as it is approved, we're launching! I'm guessing it will be Mon, Tue, or Wed. 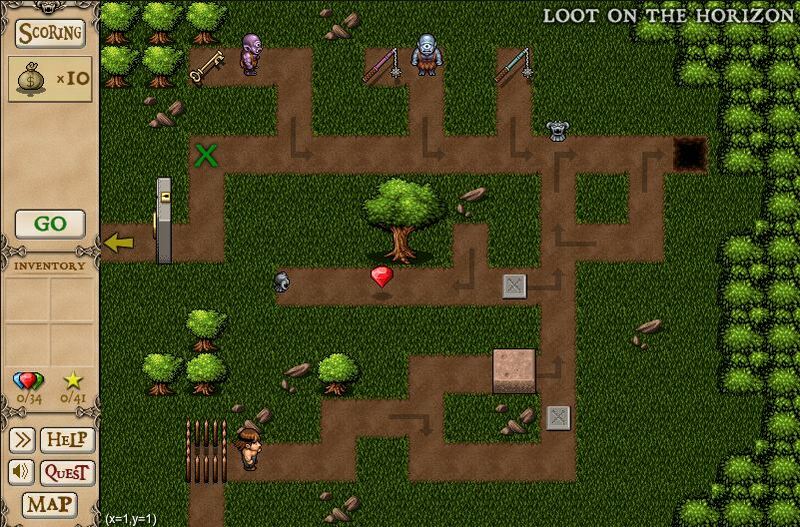 I've had the beta up on Kongregate for about a week now, and so far, it's been well received. It is only available to Kong+ members (their premium subscribers) and Kongregate moderators, so the sampling pool is small, but all the comments have been positive. I'm breathing a huge sigh of relief at the lack of bugs being reported. I think my current build is pretty solid. We are still testing the iPad version, finding little bugs here and there, but the release date is holding strong. We will be finished by the end of week, and start the whole Apple application uploading and approval business. Maybe I should start a Kickstarter. If I raise $500,000, everyone gets a talking Questy doll. Sound good? Ok, here it is, the official release dates! The iPad version will be hitting the App Store on April 16th, and the Flash version will hit Kongregate on April 17th. It feels so damn good to type that sentence. It's that time again. I'm posting a target release date. Well, it's a target release month of April, that's the best I can do at the moment, but I feel really good about it. Dave and I, my good friend that has coded the iOS version, have decided we're going to release the iPad version for free up through the Forest levels. From there, if you want to stick by Questy and save all of Talesworth, it would be $1.99 to unlock the rest of the game. It's done, and now we're in bug testing, and adding some small enhancements based on some beta testing. Also, I decided that I'm going to release the Flash version in parallel, for free, in its entirety. I do think it shines on the iPad, but keeping it free in Flash makes its accessible to loads more people, and ultimately, that is my goal. I find so much happiness in making games, but I also love when people play them. I couldn't be more excited to set this thing free! I received a great suggestion today from a fan by the name of Alex, an innovation in how I handle my community. A newsletter...! Yes, I know, I should have made this happen a while ago, but I like making you guys type talesworth.com into your browser so you have to work for my [random and sporadic] news about my games. Thanks for your continued interest! We are in the bug testing stage at the moment. I'm going to post the official launch plan shortly, and my decision on the fate of the Flash version.